What are your favorite keyboard shortcuts on Mac OS X? ctrl+F2: Access the menu via the keyboard (Windows alt+space equivalent). Typing / on any file dialog will give you a "go to folder" dialog, which autocompletes with tab (you have to wait a second for it to work). This lets you type in the full path, from the root / folder. Extra handy if you want to open from / save to hidden locations or already have the command line path you want to save something in. This can be also accessed via ~ (i.e. the tilde key, to start from your home directory, e.g. ~/Documents) or using cmd+shift+G (which starts with the most recently entered directory). Then you can launch any application, open most files, do quick calculations, etc. 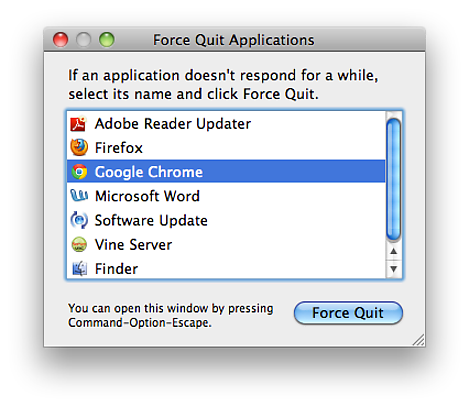 Command ⌘ + Option ⌥ + Esc ⎋ brings up the force quit dialog, which is handy for killing unresponsive applications. Command ⌘ + Option ⌥ + Shift ⇧ + Esc ⎋ held down for 5 seconds kills the foremost application. ⌘+` (backtick): Cycle through app's windows. ⇧+⌥ and the increment/decrement light or sound button. It is extremely useful with LED Cinema Display monitors. Save the file, and when you next start a Cocoa app (eg Mail, TextEdit etc) you will find that Home, End, Pg Up and Pg Down now work as they do on Windows. It's well worth having a look at the whole of that article - he explains exactly how to make this file and how the bindings work, with information about the other keycodes etc. ⌘+E: Put selected text into search clipboard. Then ⌘ + G to find next. In combination with regular copy-paste you can do selective search and replace very quickly and conveniently. Holding down the ⌥ while booting to select the startup volume. Holding down C while booting to boot from a CD/DVD in the drive. While being in the application switcher (using ⌘+⇥) cycle to an application by pressing ⇥ or ⇧+⇥; then - while still holding down ⌘ - press the down arrow to see an expose view of the selected app´s windows, including minimized windows. Using the arrow keys navigate to a window you want to bring to the foreground and hit ← to select it. ⌘+W: Close window (or tab). ⌘+⇧+4+space+click on a window copies the current window to the desktop. This is very useful while taking screenshots without the need to crop. The rounded edges stay rounded. Use this with ctrl to copy the image to the clipboard. ⌘+`: Cycle through the current application's windows. ⇥: Auto fill commands and file/directory names in Terminal. ⌘+⇧+4: Take a screenshot of a selected area. ⌘+⇧+3: Take a screenshot of the whole screen. All of the shortcuts are my favorite! ⌘+alt+shift+V pastes plain text, SUPER useful for copying from web pages or MS Word into email, and leaving the weird formatting behind. Not wholly keyboard shortcut, but holding down the Option key (⌥) and bringing up a system menu often provides extensive information. For instance if you are connected to wifi, hold down ⌥ and clicking on the network menu will bring up a lot of information (MAC address, IP address, signal strength, et c.) about the current network connection. Holding ⌥ and clicking on the notification icon also sets your notification status to "Do not disturb"---rather useful when discussing something on your screen with colleagues and you don't want to see Messages popping up. ctrl+← or ctrl+→ to move between Mission Control spaces (in Lion). What's the purpose of the eject button on the MacBook Air? How to get overview of keyboard shortcuts from OS X? Quickly open your favorite folders on OS X? What are alternative keyboard shortcuts for Mission Control if you use Xcode? How to import OS X keyboard text shortcuts? Can I show keyboard shortcuts (hotkeys) on Mac OS X?